Kingsland Parish Council is producing a Neighbourhood Plan for the parish of Kingsland, which will help us have some influence on planning applications approval/refusal for building and development in the parish until 2031. This page will keep parishioners up to date with progress. On the additional pages are details of The Steering Group, Meetings’ Agendas and Minutes and background information on Neighbourhood Plans, why it’s so important for us to have one and what needs to be done to produce one. There will be a Parish Referendum on the Kingsland Parish Neighbourhood Plan on Thursday 7th September. Please see the Public Consultations and Documents page to read the final Plan and other important documents. Herefordshire Council have published the Decision Document and a new Environmental Report and Habitat Regulations Assessment Addendum. Please see the Public Consultations and Documents page for more information and to read the documents. The independent Examiner has published her report which we have published on the Neighbourhood Plan Community Consultations and Documents page. The Examiner has recommended to Herefordshire Council that subject to the modifications proposed in her report that it proceeds to a referendum. The Parish Council and Herefordshire Council have responded to the independent Examiner’s questions of clarification. Their responses can be read via the links in the Independent Examination section at the top of the Neighbourhood Plan Public Consultations and Documents page. The Evidence Base has also been updated with a new Planning Applications document (Document 1) which details the number of dwellings granted planning permission from 2011 until April 21st 2017. We will update this page with any further news when we receive it. The Examiner has asked a number of questions of clarification with regard to the neighbourhood development plan, which can be seen on the Neighbourhood Plan Public Consultations and Documents page. The parish council is due to consider responses to the questions of clarification at 7.30pm on Friday 21 April 2017. The Evidence Base on that page has also been updated . Document 1 has been updated and all links to the new Herefordshire Council website should now be working after their website renewal. The Evidence Base (near the top of the Neighbourhood Plan Public Consultation Documents page), has been revised with an updated Planning Application Document (Document 1) which shows 70 dwellings have been constructed or have planning permission in the parish. This is above the minimum of 14% (66 dwellings ) required to be built by 2031 in Herefordshire Council’s Core Strategy. The Independent Examiner is currently examining our Neighbourhood Plan and we have been told that the examination will be completed in mid-April. We will update this page when we have any further news. We have been informed that the independent examiner has started the examination of the Neighbourhood Plan and it should be completed in mid April. We will update this page when we have any further news. Current news on the Neighbourhood Plan is that it will be examined in March 2017. We have no timetable after that. Meanwhile the Evidence Base, available near the top of the Neighbourhood Plan Consultation Documents page (under Parish Council), has been updated with a new version of Document 1 being added. The Parish Council chose the independent examiner for the Neighbourhood Plan in their October meeting. However because of the number of examinations going on, the actual examination of the Plan will not happen until February/March 2017 and we have no further information on the timetable from that point. We will continue to update this page as well as our Facebook page and Twitter feed if we get any more news than the above. Meanwhile we hope you all have a happy Christmas! 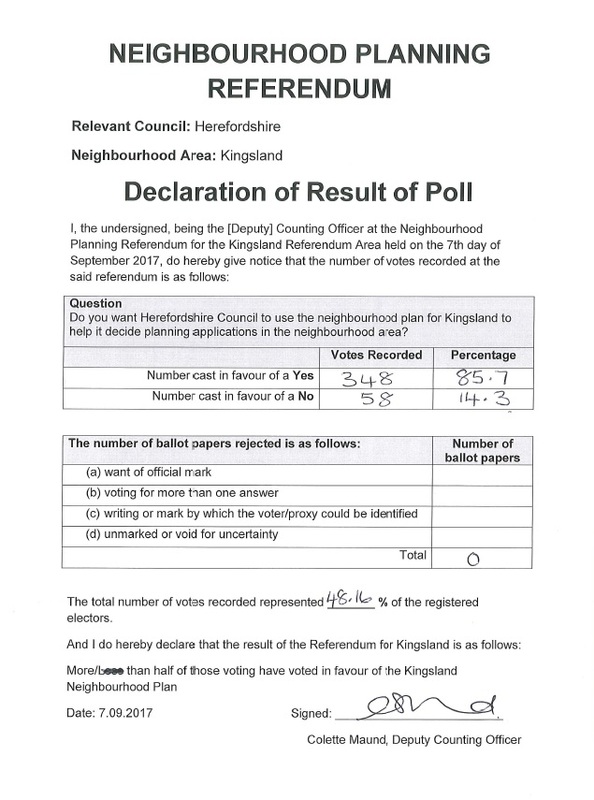 As mentioned below, the Kingsland Neighbourhood Plan has been recommended by Herefordshire Council to go forward for its independent Examination and the Parish Council will be selecting the examiner from a list provided by Herefordshire Council at their 18th October meeting. We have no dates for when the examination will be completed but will update when we get further news. Meanwhile the Evidence Base has been updated with additional information for the examiner and is on our Public Consultation Documents page. We will keep updating this page as we get further news. The Regulation 16 Public Consultation below has now finished. We will update this page when we hear the outcome from Herefordshire Council. After further work, the submission draft of our Neighbourhood Plan has been submitted to Herefordshire Council and the second ‘Regulation 16’, final public consultation is underway. The draft plan will now carry some weight when planning applications within Kingsland parish are being decided by Herefordshire Council. This consultation is conducted in accordance with Government regulations, so please note it is being run solely by Herefordshire Council and all comments or representations must be made direct to them. Consequently, the Parish Council, Parish Clerk and the Neighbourhood Plan Steering Group cannot accept or forward any comments or representations and any received will have to be returned. You can find the draft Neighbourhood Plan, approved by the Parish Council, and all the other consultation documents and details of how to respond to Herefordshire Council on the Herefordshire Council Neighbourhood Planning page for Kingsland here. The documents and consultation details are also on our Parish Council/Neighbourhood Plan Consultation Documents page here. A paper copy can also be read at Leominster Library, 8 Buttercross, Leominster; Hereford Centre, Franklyn House, 4 Commercial Road, Hereford HR1 2BB and at Blueschool House, Blueschool Street, Hereford. Once the consultation has finished, the plan will undergo an independent examination and finally there will be a referendum, giving everyone in the parish, who is on the electoral roll, the opportunity to vote on whether to adopt the Neighbourhood Plan. Without it, we as residents of the parish will have no influence on planning applications and where development takes place over the next 16 years. Effectively, none of the views you have expressed via the Parish Plan survey, Neighbourhood Plan consultation events or by other means will be taken into account when planning applications within Kingsland parish are being decided. Herefordshire Council will make ALL the decisions as to where and what type of housing is built in our parish. So, many thanks for all your input. Hopefully we are coming to the end of an extremely long road! Kingsland Neighbourhood Plan Steering Group. The Neighborhood Plan Steering Group meeting on 4th July has been cancelled. The Submission Draft of the amended plan and associated documents were approved at the Parish Council meeting on June 30th so the Steering Group will now be submitting the plan to Herefordshire Council for completion of the Habitats Regulation Assessment and Strategic Environmental Assessment. Following this there will be a second Regulation 16 public consultation. We are aiming for this to start as soon as possible! There is a Steering Group meeting provisionally booked on Monday 4th July, 7pm at the Post Office, following the Parish Council discussions of the amended Neighbourhood Plan and associated documents at the Parish Council meeting on Thursday 30th June (see PC Meetings page for agenda for that meeting). This is in preparation for re-submission of the Neighbourhood Plan to Hereford Council for a second Regulation 16 public consultation. The nature of the waste water treatment constraint and its effect upon the housing target for Kingsland village. You can see the Evidence Base via the link on the Neighbourhood Plan Public Consultation page or by clicking the link here. There will be a Steering Group meeting on Monday 27th June. Details in the Village Diary and the Agenda is on our Agenda and Minutes page. The Evidence Base on our Public Consultation Documents page has been updated with new documents on page 2. More documents will be added as we move towards the second Reg 16 public consultation. Since our last news item in May, we have provided updated information on the parish’s ability to build the minimum number of new houses required primarily in the three proposed settlement boundaries for Kingsland, Shirlheath and Cobnash. This was requested by Herefordshire Council in order for us to meet their Core Strategy requirements for housing development until 2031. It is agreed that our numbers are robust. However, because of Government regulations, the draft Neighbourhood Development Plan is to go through another Regulation 16 public consultation. This is due to amendments made in light of updated information regarding its ability to provide sufficient housing land, the representations received during the last Regulation 16 consultation and any other issues arising since then. These include new evidence on the limited capacity in the Kingsland sewerage works for new development and associated issues of potential pollution of the River Lugg, which is a key Core Strategy issue in relation to the reduction in pollution of the River Wye. So yet more work for us to do to make sure we satisfy the Neighbourhood Plan Regulations, the Core Strategy, the government’s National Planning Policy Framework (NPPF), and still represent the wishes of those who live or work in the parish from the views you have given across all of our consultations over the last three years. We’d like to thank our planning consultants Data Orchard, who have been pivotal in helping us to move this project forward. Without their time, hard work and planning expertise the workload for our small band of volunteers would be even more onerous than it already is! As usual we will keep these Neighbourhood Plan pages updated with news and meeting notices. The latter will also be put up on the village noticeboard, in the Post Office, on our Facebook page and Twitter feed. Many thanks for your patience and hopefully we will have some good news soon! The next Steering Group meeting is on Monday 20th June, 7.00pm at the Post Office. The agenda will be on the Agenda and Minutes page when it is available. Everyone welcome to come along! The next Steering Group meeting is on Tuesday 31st May, 7.00pm at the Post Office. The agenda is on the Agenda and Minutes page. Everyone welcome to come along. We are currently working on providing information to Herefordshire Council that they requested following their ‘Regulation 16’ public consultation and the legal challenge to the Kingsleane planning approval. We are having some Steering Group meetings, which are open to the public, to discuss the issues that have arisen so please do feel free to come along and give us your views. They are all publicised here, on our Facebook page and there are posters on the noticeboard in the village and the Post Office. This is a slow process but hopefully we will have more concrete information on the progress of our Neighbourhood Plan soon. Please keep an eye on this page where we will let you know if anything significant happens! The next Steering Group meeting is on Monday 9th May. Please see the Village Diary and the Agendas and Minutes page for details. Everyone is welcome to come along! There is a Steering Group meeting on Monday 18th April. Please see the Village Diary and the Agendas and Minutes page for details. Everyone is welcome to come along! There is a Steering Group meeting on Monday 4th April. Please see the Village Diary and the Agendas and Minutes page for details. Everyone is welcome to come along! Thank you for responding to the public consultation. All the representations received and Herefordshire Council’s report on the consultation are now on Hereford Council’s website and the Public Consultation page of these Neighbourhood Plan pages. To summarise, Herefordshire Council Neighbourhood Planning have reviewed the plan and representations alongside planning policies and are very positive to it as it stands. However, because of circumstances beyond our control that might affect the council’s approach to the housing figures in the plan i.e. the legal challenge to the planning permission granted for the land adjoining Kingsleane, we cannot at this point proceed to the next Independent Examination stage. Effectively we have to wait for resolution of this issue and we are currently in discussions with Herefordshire Council on how to proceed. When we have further news we will update the website pages and details of Steering Group meetings will be posted on the village notice board, in the Post Office, on KingslandLife and Facebook when they are arranged. We hope that this issue will be resolved soon so that the Neighbourhood Plan can move forward and meanwhile will do our best to keep you informed of progress. The final public consultation being run by Herefordshire Council has now finished so thank you to all those who responded. The next stage of the process laid out in the legislation is for Herefordshire Council to appoint an Independent Examiner who will then look at the Plan, all the other associated documents, as well as all the representations received. The documents the Examiner will be looking at are on the Neighbourhood Plan/Public Consultation page here. During the examination the plan will be judged against the ‘Basic Conditions’ outlined in government legislation. To summarise this means it will be judged on whether the Neighbourhood Plan complies with the National Planning Policy Framework, any other government planning guidance, Herefordshire Council’s Core Strategy and other relevant European legislation. The Examiner may then suggest any amendments they think necessary for compliance. At the time of writing Herefordshire Council is predicting that the examination will take place around the end of February. It is then another 2-3 months until the parish referendum will take place. Meanwhile, if there is any other news we will update this page so please look here for the most up to date information we have. The ‘Regulation 16’, final public consultation being run by Herefordshire Council finished on January 4th. Our Neighbourhood Plan will now carry some weight when planning applications within Kingsland parish are being decided. If you’d like to read the submitted plan and associated documents they are all on the Neighbourhood Plan/Public Consultation page. The Neighbourhood Plan is very important for our parish. Without it, we as a parish will have no influence on planning applications and where development takes place over the next 16 years. Effectively none of the views you have expressed at events, via the Parish Plan survey or other means will be taken into account when planning applications within Kingsland parish are being decided. Without it, Herefordshire Council will make all the decisions as to where and how much new housing is built and e.g. what type and style it is, under their new Rural Areas Plan. We will keep you informed of the outcome of the consultation and progress towards the independent examination and parish referendum via this page and we will also post notices on the village noticeboard and in the Post office when Steering Group meetings are arranged (none arranged at the time of writing). Many thanks again for all your input which will help determine how our village and parish will develop and look over the next few years. Well, after a lot of hard work our Neighbourhood Plan and numerous other documents we had to produce have all gone to Herefordshire Council and the final ‘Regulation 16’, public consultation is underway. This means that our Neighbourhood Plan now carries some weight when planning applications within Kingsland parish are being decided. The submitted Plan has taken account of all the comments made by parish residents and others on the draft plan earlier this year, comments from the event we held in September and all the changes made to Herefordshire Council’s Core Strategy which was finally adopted in October. This consultation has to be conducted in accordance with Government regulations, so please note it is being run solely by Herefordshire Council and all comments or representations must be made direct to them. Consequently the Parish Council, Parish Clerk, The Neighbourhood Plan Steering Group or any of their members cannot accept or forward any comments or representations and any received will have to be returned. You can find the Neighbourhood Plan approved by the Parish Council and all the other consultation documents, the closing date for the consultation and details of how to respond to Herefordshire Council on the Final Public Consultation page here. You will also find a link to the Herefordshire Council consultation page. Once the consultation has finished, the plan then undergoes an independent inspection and finally there will be a referendum, giving everyone in the parish who is on the electoral roll the opportunity to vote on this important document. The Neighbourhood Plan is very important for our parish. Without it, we as a parish will have no influence on planning applications and where development takes place over the next 16 years. Effectively none of the views you have expressed at events, via the Parish Plan survey or other means will be taken into account when planning applications within Kingsland parish are being decided. Herefordshire Council will make all the decisions as to where any housing is built and e.g. what type and style it is under their new Rural Areas Plan. So, many thanks for all your input! October has been a busy month for us but we are pleased to say our Neighbourhood Plan was approved by the Parish Council at their meeting on October 20th. We are now finalising all the documents that need to go to Herefordshire Council so that they can start our Regulation 16 consultation which is the final 6 week public consultation. This will be your last opportunity to make comments. This final consultation is run via Herefordshire Council’s website and they deal with all responses. We will put notices up in the village and a link on the KingslandLife website Neighbourhood Plan page when the consultation starts. Meanwhile Herefordshire Council adopted their Core Strategy for development in the county on October 16th. This now governs all planning applications. However, as soon as the final Reg 16 consultation starts our Neighbourhood Plan will also have influence on any planning applications that are made, hence our hard work to submit everything to Herefordshire Council as soon as possible. The final step after the Reg 16 consultation is examination by an independent examiner, then there is the parish referendum where hopefully you will vote to adopt it. It is very important for our parish that we have a Neighbourhood Plan as without it we come under Herefordshire Council’s new ‘Rural Area Plan’ which effectively means that we as a parish will have no influence on where housing development is allowed or on what type or size it is. Without a Neighbourhood Plan all the views you’ve given in the Parish Plan survey and Neighbourhood Plan consultations will not be taken into account when deciding on planning applications. Because of the urgency to submit everything to Herefordshire Council, Steering Group meetings may be held at short notice but details will all be posted on the KingslandLife website, on the village noticeboard and in the Post Office. The website page will also be updated with all the latest news. If you have any questions feel free to mail us on kingslandneighbourhoodplan@gmail.com or call our Secretary Patricia Pothecary on 01568 708597. Firstly thank you to everyone who came to the church or responded online to the consultation on Cobnash and Shirlheath. The Steering Group and our planning consultants have used your input to agree development boundaries for both settlements, which are marginally reduced from the ones proposed at the consultation, in response to your views. We hope that by the time you read this the resulting amendments to the draft Neighbourhood Development Plan will have been made, thus enabling us to meet Herefordshire’s new Core Strategy requirements. The plan then goes to the final six week public consultation, (under regulation 16 and run by Herefordshire Council). At this point you will then have another chance to make comments on the whole plan. This process has been very long but we are hoping it will all be complete by the end of the year. Following changes to Herefordshire Council’s Core Strategy (see section below), we held a consultation with parishioners on Friday 4th and Saturday 5th September on whether development should be allowed in Cobnash and if so where, plus where development in Shirlheath should be allowed. The consultation was also online from 6th – 13th September 2015. As many of you will know, progress with the Kingsland Neighbourhood Development Plan (KNDP) has been delayed. Following the community consultation on the draft plan, the KNDP was ready in March, to go to the next stage for consultation with Herefordshire Council, before examination by an independent Government Inspector. However this was not to be. Following Herefordshire Council’s own Core Strategy examination, a shortfall in the intended housing numbers for rural areas was identified. Consequently the minimum number of houses required for rural parishes such as ours is 14% of dwellings in the whole parish, and not just within the main settlements of Kingsland and Shirlheath, as had previously been advised by Herefordshire Council. What does this mean for Kingsland parish? Instead of the minimum total of around 44 dwellings needed for Kingsland village and a further 7 dwellings for Shirlheath, we now have to plan for a minimum total of 65 dwellings within the whole parish. The Steering Group has appointed independent planning consultants Data Orchard to carry out additional work and advise on the way forward. This will be funded largely by a government grant. It is thought, at this point, that with fine tweaking the current KNDP can probably stand although there may be a need for some minor amendments to plans for Shirlheath and Cobnash. If minor changes are required, the Steering Group will consult with residents of these two settlements in due course. We will keep you all informed as we progress. If you wish to know more minutes and agendas of each meeting are posted on the Minutes and Agenda page. Meeting dates are also posted in the newsletter, on Facebook (Kingsland Neighbourhood Plan), Twitter (@KingslandNP) and on the village notice board. All meetings are open to members of the community so please do come along. When we get to the next Reg 16 consultation it will then go to an independent examiner for an examination and if all is well it then goes to a parish referendum run by Hereford Council where all Kingsland parish residents on the electoral register will have a vote on whether to accept and go ahead with the plan. If the answer’s yes it will then have to be taken into account on every planning application made in the parish. So we still have a way to go and meanwhile, as always, we still need more help so if you can give us a little bit of time to help with publicity, administration or small projects we need help with, then please contact us. You don’t need to know anything about planning – it’s time, energy and enthusiasm that’s more important! You can email kingslandneighbourhoodplan@gmail.com or call our Secretary Patricia Pothecary on 01568 708597 who’ll be more than happy to hear from you! The Kingsland Neighbourhood Plan (KNP), now has a Facebook page. Just click the logo. Please ‘Like’ and ‘Share ‘ our page and join in the conversation!! We’re also on Twitter as @KingslandNP. Just click the logo and come and find us! WHAT IS THE KINGSLAND NEIGHBOURHOOD PLAN? The Kingsland Neighbourhood Plan (KNP) is a community-led document which will be about the future use and development of land within our parish over the next 20 years. Our Neighbourhood Plan will define the future look and shape of the parish and will become part of the statutory development plan for Herefordshire. The proposals we set out in our Neighbourhood Plan will be enforced by planning officers when deciding on applications for planning permission. Current planning policy is provided at a local level by the Herefordshire Unitary Development Plan, soon to be replaced by the Core Strategy. While this process is taking place and once the Core Strategy is adopted, the parish is open to ad hoc development unless we have a Neighbourhood Plan in place. Our Neighbourhood Plan will have policies which will guide development to the places we as a parish consider it should go. Furthermore, if we do not have a Neighbourhood Plan then Herefordshire Council will decide on settlement boundaries, where development should go, how many houses will be built, the scale of development and what type of houses are built. Effectively the community will have no influence on future development in the parish. The KNP is being produced by volunteers from the parish, this involves members of the Parish Council and other residents of the parish. Presently, the group is made up of 12 villagers, BUT WE NEED MORE!! We meet at The Corners Inn every month. Our calendar of meetings is in the Village Diary and notices are posted in Kingsland News. We have a very important job on our hands and it is IMPERATIVE that we have a robust Neighbourhood Plan in place AS SOON AS POSSIBLE. Without a Neighbourhood Plan, we will be open to development in places we may consider inappropriate, such as outside the current village settlement boundary. As a member of this community, your input in this process is critical and your assistance with the project is desperately needed. We need help to do everything from arranging community events to leaflet dropping.